The best way to make sure you have a fulfilling, successful future is to graduate from a four-year college. 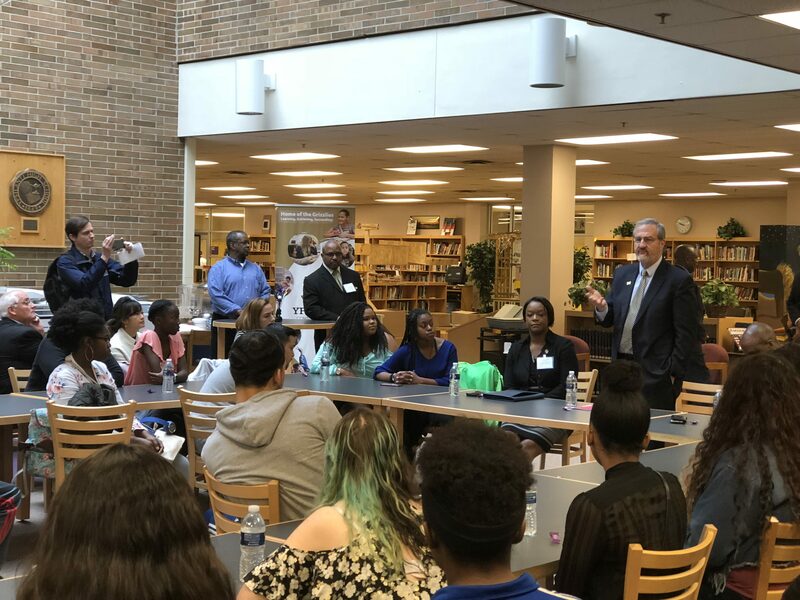 That was the message University of Michigan President Mark Schlissel delivered last week to a group of about 100 students, parents, and community members at Ypsilanti Community High School. The college hopefuls, identified as some of the most successful students in the district, gathered in the school’s media center to hear from Schlissel and Vice Provost for Enrollment Management Kedra Ishop and ask questions about the college admissions process. A few of the students in attendance had already accepted an admissions offer to the university. Schlissel shared the myriad benefits that those with a college degree can access throughout their lives, from increased income to less legal trouble to better health and longer life expectancy. “That’s really what an education is all about,” he said. “It’s to help you be as successful in life as you can possibly be. State Rep. Ronnie Peterson, D-Ypsilanti, organized the morning meeting to provide local students with access to college administrators and promote college enrollment. Earlier in the morning, Schlissel and Ishop met for a roundtable discussion with a number of local civic and religious leaders. Despite its close proximity to Ypsilanti, U-M has historically enrolled few students from the working-class community where more than three quarters of students quality for free or reduced-price lunches. That’s a trend that needs to change, said Schlissel, who pointed to a number of university programs designed to assist students from low-income backgrounds. He specifically called out Wolverine Pathways – an intensive college readiness program for students in Ypsilanti, Southfield, and Detroit – as well as the statewide Go Blue Guarantee as two examples of the university’s work toward increasing socioeconomic diversity on campus. The Go Blue Guarantee covers the full cost of tuition for any Michigan resident who is accepted to the university and has a family income less than $65,000. Ishop echoed the president’s sentiment, saying that “demystifying” the financial aid process has been one of her top priorities over the past few years.